If our occur check succeeds, we get back the checked tree, but over the thickened set of variables. The ko (`knockout') function allows us to exploit this value. ko takes a variable w from a set, and a tree t over the set one smaller (ie thickened at w): exactly the kind of tree returned by check. It returns the substitution which replaces w by t and thickens all the other variables. 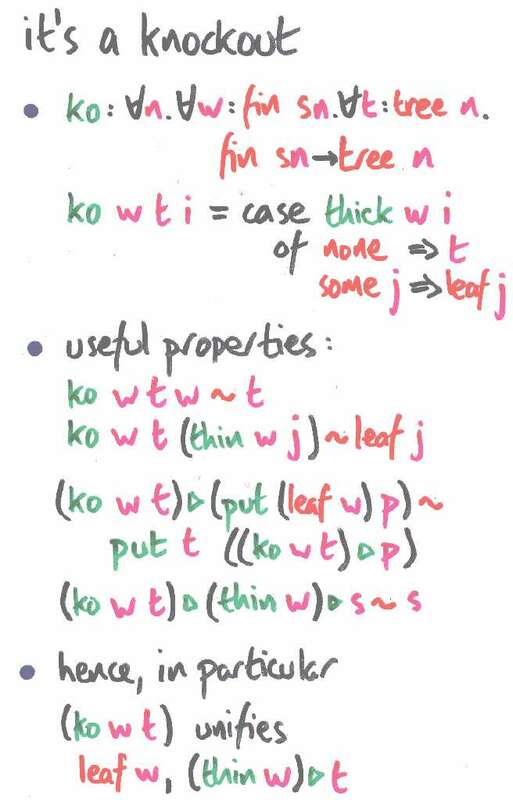 The combined effect of |>, ko and check is to implement the replacement of a variable by a tree which does not contain it. Not only is the variable replaced: it is removed from the set available, and this removal is reflected in the type of ko.